Firstly I would like to point out that I am not trying to discourage the human race from carrying out its responsibilities as I am a firm believer that we really do need to look after our planet, but I also feel we should know the truth about Climate Change. Our present understanding of climate change is based around the belief that humans are responsible for creating excessive amounts of greenhouse gases. Surprisingly this theory originates from just two sets of data obtained from ice core samples. Temperature & CO² anomalies overlay. I devised and overlaid this chart from data collected from a NASA site. Because of the similarities within the above two sets of data and charts, or because scientists could not find another plausible explanation for these results an assumption was made that one had to be the cause of the other. 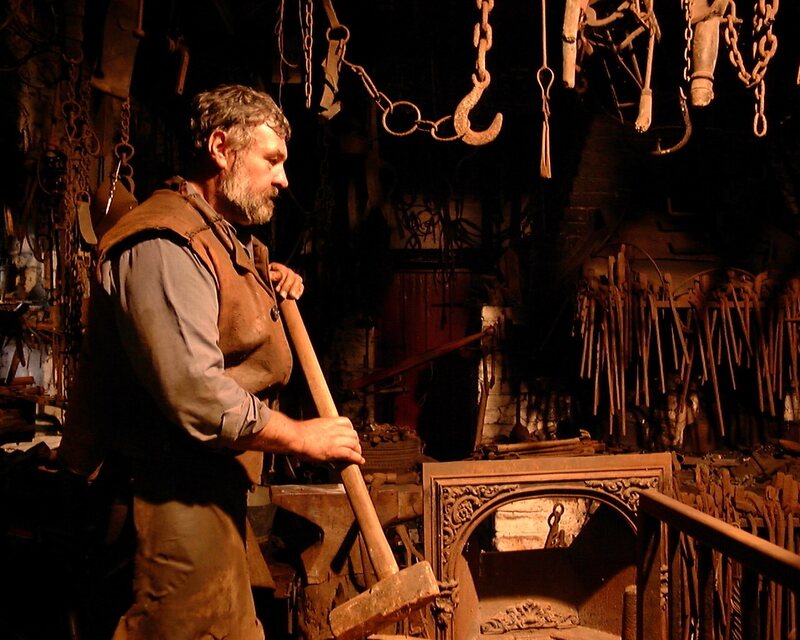 So human intervention was blamed for the creation of greenhouse gases, which supposedly cause earth’s rising temperatures through the so-called “greenhouse effect”. Unfortunately at this point most scientists stopped looking for further causes for earth’s climate changes believing the actual cause had been found. On looking at their charts and data my first thoughts were, could there be a third process causing both these sets of near matching data, as in my view, the greenhouse effect is far from being a proven theory! Soon I stumbled across another very simple but real physical process, which I am certain is causing earth’s climate differences. From this point I’m using exactly the same data scientists used to determine climate change supposedly caused by humans. Importantly, I am only using well proven data already in the public domain in order to make it possible for anyone to easily verify my findings through the use of the internet, except that is, for one chart I produced myself using magnetic pole velocity data. Most people, when asked what earth’s magnetic pole is, would probably say it is the place my compass points to. I have never been satisfied with that answer so on this occasion I asked what is the north magnetic pole? I soon came to the conclusion that it had to indicate the central axis of earth’s most powerful magnetic structure, that is, its inner core. After a little searching on the net it soon became apparent that other scientists also believed this to be true. From that point I focused on data concerning the historic procession of earth’s magnetic poles. Earth has at least three axes or poles, (a pole is the point were an axis (or center of rotation) exits an object, in this case a sphere) whether it is a slightly fictitious point, as with the geographic pole or a measurable one, as with the magnetic poles. Earth’s outer pole indicates the center of rotation of earth’s outer surface, the part we live on (its lithosphere) it is what we call the geographic pole. It’s difficult to believe but the lithosphere floats on a sea of molten magma. The next pole inward indicates the center of rotation of earth’s outer core. Less is known about this pole as it is much weaker and probably indicates the center of rotation of earth’s outer core, it is denser than earth’s mantle. The next pole inward indicates the axis of earth’s inner core, it is believed to be mainly iron and produce earth’s strongest magnetic field. It is well documented that earth’s magnetic north poles are moving and that over the past 150 years the North magnetic pole had moved some 2000kms (1,242 miles) or so. So if earth’s poles are moving surely so is its core? Therefore there must be a very real and critical process taking place at this very moment that scientists have not fully realized or understood. Until recently scientists made regular trips to the magnetic north pole in order to determine its position. I live in the UK and my two children live at roughly 90° west of me in the United States and for some years now we have been able to track the magnetic North Pole with home-made compasses. (The one I use is 14ft long and is positioned in the roof of a building). Between us we have been able to log the magnetic north poles movement. It has now passed the geographic pole. Knowing that earth’s core is predominantly iron and therefore could be causing earth’s varying geomagnetic field, I decided to spend more time studying earth’s magnetic and geomagnetic field data. Then studying phenomena scientists call geomagnetic jerks I realized that they are a very important factor in determining how magnetism affects our climate. They are basically a period when earth’s magnetic field shows major changes but more importantly, they seem only to become apparent when earth’s magnetic poles slow down, stop, or change direction. 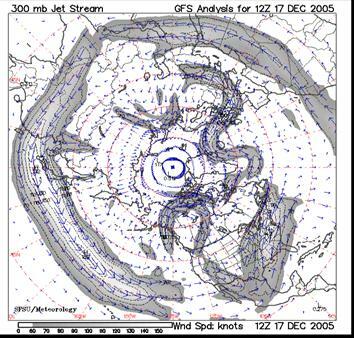 I realized that earth’s magnetic Pole velocity data coincided with important changes in our past weather patterns. For instance, in the early 1800s when the pole slowed, stopped and then changed direction, and during that time the river Thames had frozen over for seven years in succession and ice yachts were being used to ferry goods across the Hudson river. Again, in the late 1940s and early 50s there was a magnetic jerk and the Thames was frozen over at Richmond for several years. During the past hundred years or so a number of smaller jerks have also taken place and they also coincide with slightly cooler periods. During some further studies my attention was drawn to the findings of a small group of scientists who have evidence that earth’s core is a large hexagonal crystalline structure. Already knowing that Iron molecular structure is hexagonal this instantly reminded me of something NASA found around 1980 near Saturn’s north pole. It is a large hexagon shaped cloud formation racing around Saturn’s pole at high speed, it has puzzled scientists ever since. (See graphic below) or check it out yourself. To me, clouds racing around the top of a planet looked rather like a jet stream so I decided to look more closely at earth’s own jet streams. 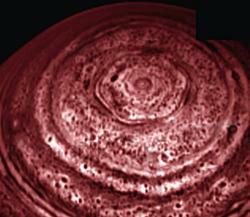 It was not long before I found data that told me earth’s own jet streams are also hexagonal. 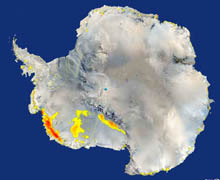 The above graphic was produced from data supplied by NASA obtained from Bolder University in Colorado USA. It shows earth’s own northern jet stream as a distinct hexagon, so it would be very difficult for anyone to deny that earth too has at least one large hexagonal stream of fast-moving gas and cloud traveling around at least one of its poles. 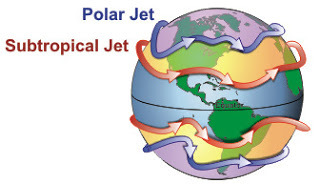 After animating some of the data available on jet streams I found that they were rotating at a little over 13 times a year faster than earth’s surface layer in an easterly direction. This is the same number of times our moon travels around earth each year and in the same direction. From a very young age I wondered why only one side of our moon faced earth but could never accept the scientific explanation of it being coincidental. Now, if I am correct, earth’s core and its moon have to be magnetically linked in some way! On further study I came across a phenomenon called diamagnetism, it is a force few people have ever heard of. It’s a type of magnetism that causes both poles of a magnet to repel a substance or material that is diamagnetic. Believe it or not water is diamagnetic and easily pushed along by a powerful magnetic field. If you wish to see this effect click here on my Anti Magnetic Water experiment. This experiment was performed on a horizontal plane with two opposing test tubes filled with tap water, then the same experiment was carried out using sea water and produced the same result. It was also repeated a number of times without water and returned no results at all. At this point l was convinced that diamagnetism is probably one of the most powerful drivers in the movement of water around our planet and therefore one of the biggest factors affecting our weather patterns and shifting climate. It not only drives our saturated atmosphere, our cloud formations and jet streams, but also our ocean currents. I produced the 3D graphic below myself. It is an attempt to show how a hexagonal magnetic force fields would appear to us if we were to look at them from the side & top of our planet. 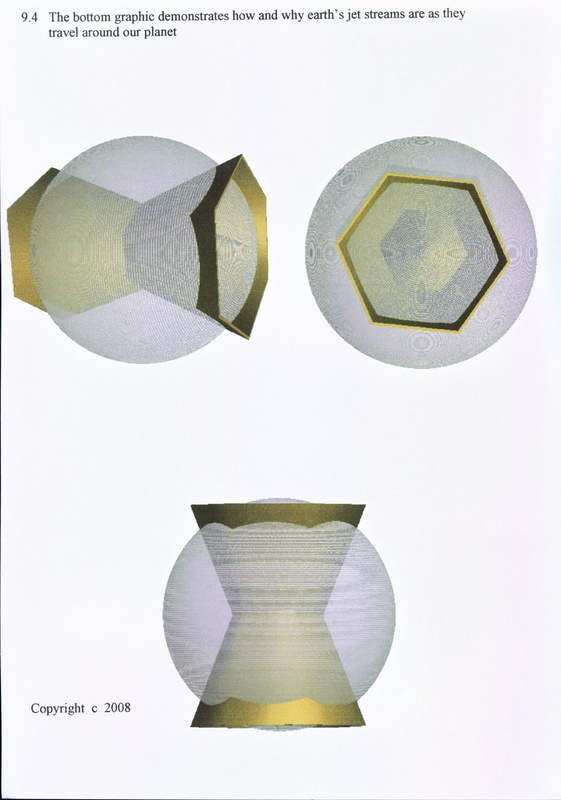 Note that as they exit earth’s surface, looking from the side (top left & bottom) they appear in the form of Rossby waves identified by Carl-Gustaf Arvid Rossby, but when viewed from either pole (top right) they are definitely hexagonal in shape. These waves replicate earth’s jet streams and as earth’s core rotates it’s force field is driving them in the form of the jet streams that we now today. (By the way, it was recently found that Rossby waves are also present within ocean currents across earth’s sea beds and at the same latitude as the jet streams in the northern Pacific, they also flow in an easterly direction so would almost certainly be driven by the same force namely (diamagnetism). At this moment in time Scientists believe that earth’s moon pulls on its oceans thus creating earth’s tidal system. But, as water is diamagnetic it must surely be the opposite!!! It is repulsion or (diamagnetism) that affects earth’s overall tidal system. Instead of the moon pulling on our seas, it has to be both poles of earth’s core pushing them up with a diamagnetic force. this to us it would create the illusion that our moon is pulling up our oceans, when in actual fact it could be earth’s core pushing them towards the moon. This next picture shows the typical pattern of Rossby waves created as our jet streams undulates around our planet. It was during 2002 I first suggested earth’s jet streams and ocean currents were moving northward on the western side of our planet and that its animal and plant populations were moving with them. This is now very evident, and during that same period the north magnetic Pole was moving in the same direction as all migrations. Now given that earth’s Arctic Circles occur just inside its arctic jet streams, it is reasonable to assume that earth’s ice caps are actually moving with those jet streams. It would certainly explain why our ice caps are melting more on one side than the other, also why they are melting at different rates. If one were to study the pattern of melting on both earth’s poles, you would find that the melting patterns match the velocity and direction of movement of both earth’s magnetic poles. 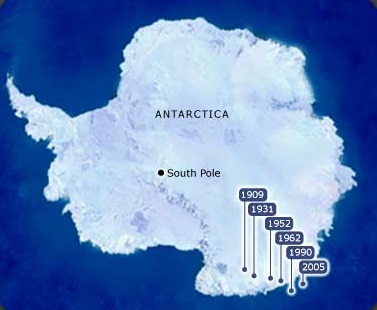 The graphic below shows the intense melting at the South Pole at the time the graphic was produced; and the following graphic shows the direction & distance the pole was moving from that area at the time. The South Pole has moved considerably less than the North thus indicating that earth’s core it is out of center and probably out of balance with earth’s outer layer (lithosphere). We can already assume that earth’s outer layer is out of balance because of the fact that our north magnetic pole has a daily movement of around 200km (124 miles) in an oval shape! This is simply the difference in mass between one side of our planet with most of the continents on it and the other side with the Pacific ocean. So lets now look at the North Magnetic pole movement as it travels northward. It too is rapidly moving away from the area that is warming fastest , namely the northern part of Canada and heading for the arctic ocean. Also its the areas our magnetic poles are moving from are now producing enormous amounts of CO2 from the rotting organic material being exposed by the melting ice, it has been doing this for many years and creating the same CO2 that is being recorded as the cause of climate change. I would like to put for ward a new theory. Just suppose earth has never actually seen a full ice age but instead earth’s poles just sway back and forth to varying degrees covering different parts of the planet each time. Then later in history it would appear to an observer as though earth’s geographic poles had been in a total ice age around that period, when in actual fact they may only have been local ones! For example, the North Polar Region has recently left the northern part of Canada and now appears to be heading towards Russia. The Canadian region will therefore look as though it has been in an ice age in the past, then, if the pole were to move again, say to China, it would then indicate that an area near Siberia had also been in an ice age, and so on, later giving the appearance of a totally covered ice cap. 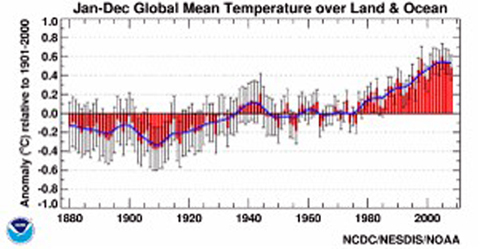 The chart below has been produced from some of the latest climate data available from around our planet and shows earth’s temperature data for the past 130 years. I would say it is fairly good scientific data that was published around 2011. Now using magnetic pole velocity data I have produced the crude chart below and hope you can see the similarities to this scientific temperature data. The above chart demonstrates an undeniable physical process that matches earth’s C02, temperature and magnetic data over the past 150 years. In producing the chart above I used exactly the same data scientists used to indicate that they believed humans were to blame for the so-called greenhouse effect. My findings were taken from exactly the same data scientists used to determine humans were the cause of climate change..(This data is readily available on the net except for one magnetic pole velocity chart I produced myself from magnetic velocity data collected from the internet and by myself along with my two children). I welcome argument (discussion) on my finding that Diamagnetism controls all weather, including unusual weather related conditions and happenings within earths Biosphere. Climate Change is caused by the movement of earths core plus the diamagnetic effect of water, I also welcome your comments on earth expansion that I am certain is happening.